By descent in family. The subject’s grandson detailed the history of his grandfather and the ownership of the painting on an upside down blank invoice. The painting and note passed down through several generations to the current owner. The subject’s extremely high and wide collar and neck cloth indicated a date in the mid-1830s. Facts below pinpoint a probable time frame of February, March, or April 1835. Robert Patterson Clark was born in Bedford County, Virginia, in 1791. By the time he was 9, the Clark family had moved to Madison County, Kentucky. Robert was still a teenager when he studied law with his maternal uncle, David Bullock, passed the bar, and became the Clerk of Estill County, Kentucky. He was 20 when he married 17-year-old Malinda Trigg on October 17, 1811. The War of 1812 soon separated them. Clark returned home with the rank of captain. Their daughter, Elizabeth Trigg Patterson, was born on January 11, 1813; and a son, Stephen Trigg, in 1815. In 1816/1817, Clark resigned his Estill County clerkship to move to Missouri Territory. His entire family — his father, brothers, and sister — all traveled together to settle on the east bank of the Missouri River in the town of Franklin in Howard County, Missouri. After the birth of their third child, Robert Patterson Clark, Jr., in 1817, Robert and Malinda moved across the river to Boonville in Cooper County. Their son Bennett Christopher Clark (1819 – 1890), born on July 13, 1819, is said to have been the first white child born in Cooper County. When the river was passable, Robert, Malinda, and their children would have returned to Franklin for family events, such as the wedding on February 10, 1819, of Malinda’s younger sister Elizabeth (1801-1858), 17, to a 31-year-old entrepreneur from Lancaster, Pennsylvania, John Thornton (1787-1847). 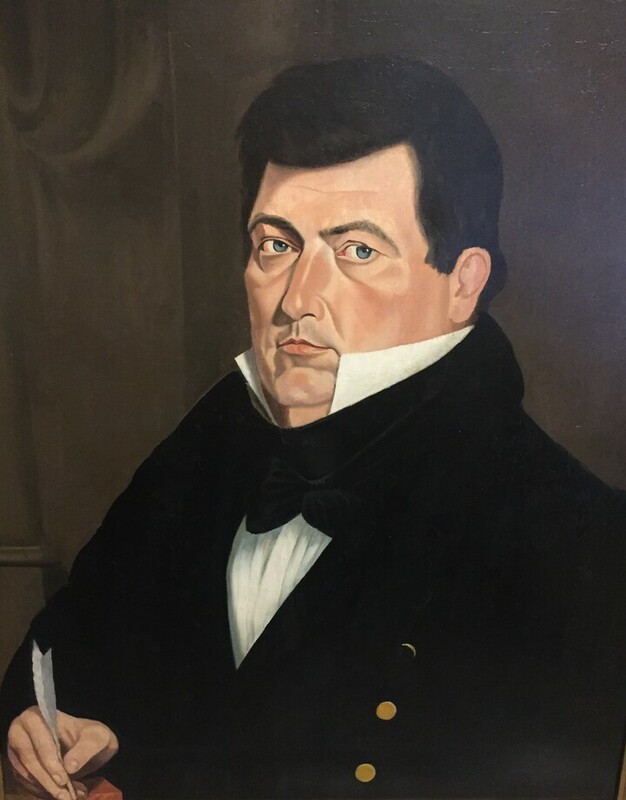 The next month, Judge David Todd (1786-1859), an uncle of Mary Todd (Mrs. Abraham Lincoln), appointed Robert Clark the first Circuit Court Clerk of Cooper County. The first session of the Cooper County Court was held in the Clark home, a large one room cabin. Not only was court held there, the judge and attorneys lodged there. Clark expanded his home before the next year’s session. Another of Malinda’s younger sisters, Dinah Ayres Trigg (1803-1886), 19, married Shubael Allen (1793-1841), 29, of Goshen, New York, the best friend of John Thornton, the husband of their sister Elizabeth, in Boonville on September 19, 1822, The two younger couples moved 100 miles west to the state’s frontier border, Liberty, Missouri. Two years later, on August 17, 1824, Malinda Clark, 30, died after giving birth to their fifth child, Malinda Dianna Clark (1824-1851). Robert Clark waited a dozen years to remarry. For his second wife, he chose Susan Kennerly Terrell (1805-1897), a 30-year-old widow of Boonville physician, Dr. Christopher Johnson Terrell (1798-1833). In his first existing letter, George Caleb Bingham wrote, “[I] was equally surprised [to] learn that Capt. Clark should even think of getting married, or that Mrs. Terrell should accept such a mountain of a man.” Not long after he penned those words, Bingham painted Clark’s portrait. Clark is not a typical Bingham portrait. The young artist had not yet formulated his signature style. But many of Bingham’s characteristics can be seen. The subject is not a flat figure floating on canvas usually seen in the work of untrained painters. Bingham created a convincingly solid portrait. Clark has substance. As Bingham painted him, he was a man with a strong presence, no matter his size, who could fill not only a canvas, but a room. Bingham’s planar luminism echoes the best of primitive portraits by artists such as Ammi Phillips or those of the Prior-Hamblin School. But Bingham had not seen their work. Although equally simple and honest, his naive style is his very own. Ambitiously, he inserted a column and drape of distinction. Another sophisticated addition for so inexperienced a portraitist was to paint the top jacket button in shadow, just as it would have been shadowed as it leaned forward during the sittings. Most ambitiously of all, Bingham signified his subject’s political service by depicting a quill pen in his hand. Hands are among the most difficult human features to paint. 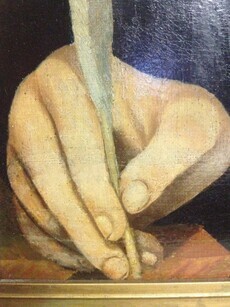 John Thornton’s thumb has long been referenced as Bingham’s first attempt at a hand. But, Robert Patterson Clark was an earlier painting. Logically, Bingham may have painted Robert P. Clark as one of two companion wedding portraits near the time of his marriage to Susan Terrell on August 27, 1835. But the vest and heavy jacket Clark wore to sit for his portrait were far too warm for August in central Missouri. The clothing indicates a cooler season. My theory is that Robert Patterson Clark was probably a generous person as suggested by opening his home to judges and attorneys and by his popularity at the polls. In the custom of the time, I believe Clark wrote letters of introduction for Bingham to John Thornton and Shubael Allen, his brothers-in-law in Liberty, Missouri. Such a letter of introduction would have allowed Bingham to stay at the home of Colonel Allen as Allen’s granddaughter remembered, “Geo. C. Bingham made his first trip to Clay County in 1835, was welcomed at the Allen home, and while in their home, painted the portraits of the Colonel and his wife.” From Bingham’s letters, we know he was in Liberty in May 1835.12] Genealogical facts, and the painting itself, imply such a scenario. If my theory is true, then the date of the portrait is between February and April 1835. The year following Clark’s second marriage, a daughter, Jane, was born. She was 5 when her father died in 1841, at the age of 50. A century and three-quarters later, this ambitous portrait, which the owner had conserved so exquisitely, engages the viewer psychologically. The fact that the creator was a 24-year-old self-taught artist makes it, arguably, the best of the early portraits of George Caleb Bingham. Genealogy from multiple records on Ancestry.com. Contact Fine Art Investigations for detailed, sourced genealogy. Bill Sullivan, “Clark House,” History and Historical Points of Interest, Boonville Chamber of Commerce, http://www.c-magic.com/boonvill/clark.htm, accessed September 2014. Henry C. Levens, Nathaniel M. Drake, A History of Cooper County, Missouri: From the First Visit by White Men in February, 1804, to the Fifth Day of July, 1876, (Cooper County, Missouri: Perrin & Smith, 1876), 188. Ibid., 55, 128. Authors noted that in the year of publication, 1879, Adam Eckhard lived on the lot of Robert P. Clark’s original home. The owners of the expanded home were Joseph and William Williams. In an online historical fragment from an old Boonville Chamber of Commerce website, last updated March 8, 2004, Bill Sullivan gave the exact address as 616 East High Street. Merlin and Roberta Schnell owned the home in 1990 and restored it. Bill Sullivan, “Clark House,” History and Historical Points of Interest, Boonville Chamber of Commerce, op. cit. Levens, op. cit., 252, 255; Sullivan, op. cit. “Letter to Sarah Elizabeth Hutchison, Columbia, Missouri, February 16, 1835,” Lynn Wolf Gentzler, editor, Roger E. Robinson, compiler, “But I Forget That I am a Painter and Not a Politician”: The Letters of George Caleb Bingham, (The State Historical Society of Missouri and Friends of Arrow Rock, Inc., 2011), 32. Elizabeth Prather Ellsberry, comp., Marriage Records (1819-1850) and Will Records (1820-1870) of Cooper County, Missouri, (Chillicothe, Missouri: Elizabeth Prather Ellsberry, 1965) 35. Lewis W. Gould, Alexander Watkins Terrell: Civil War Soldier, Texas Lawmaker, American Diplomat (University of Texas Press, 2010), 1840. (Google e-book), http://books.google.com/books?id=zRPUAAAAQBAJ&pg=PA1840&dq=robert+patterson+clark+/+susan+terrell&hl=en&sa=X&ei=zxMrVPuxGavmiwL86oHwCg&ved=0CB8Q6AEwAA#v=onepage&q=robert%20patterson%20clark%20%2F%20susan%20terrell&f=false , accessed September 2014. Terrell was a confederate general who fled to Mexico following the Civil War. By the end of the century, Grover Cleveland appointed him ambassador to the Ottoman Empire. “Letter to Sarah Elizabeth Hutchison, Liberty, Missouri, May 23, 1835″ and ” Letter to Mary Bingham, Liberty, Missouri, May 30, 1835,”Lynn Wolf Gentzler, editor, Roger E. Robinson, compiler, “But I Forget That I am a Painter and Not a Politician”: The Letters of George Caleb Bingham, (The State Historical Society of Missouri and Friends of Arrow Rock, Inc., 2011), 33-35.